The proline derivatives (2S,5S)dmamPro, (2S,5S)N-Boc-amPro and (2R,5R)dmamPro are useful building blocks for peptides since they allow conformational fixation of peptidyl–CO–N-prolyl bonds in the unusual cis conformation. 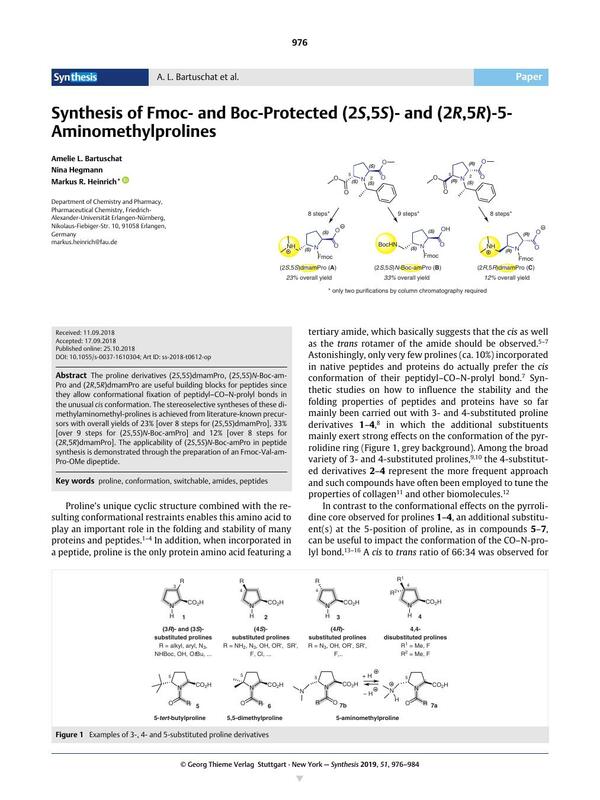 The stereoselective syntheses of these dimethylaminomethyl-prolines is achieved from literature-known precursors with overall yields of 23% [over 8 steps for (2S,5S)dmamPro], 33% [over 9 steps for (2S,5S)N-Boc-amPro] and 12% [over 8 steps for (2R,5R)dmamPro]. The applicability of (2S,5S)N-Boc-amPro in peptide synthesis is demonstrated through the preparation of an Fmoc-Val-amPro-OMe dipeptide. Supporting information for this article is available online at https://doi.org/10.1055/s-0037-1610304. 23h See also ref. 11a. 30 The optical purity of the Boc-protected derivative 17a was determined by chiral HPLC using two different solvent systems.